Assistant Professor of Management Stephanie Creary brings her research on diversity and inclusion into her MBA and undergraduate classes. Prof. Stephanie Creary’s Diversity class not only has guest speakers, it also has guest attendees. 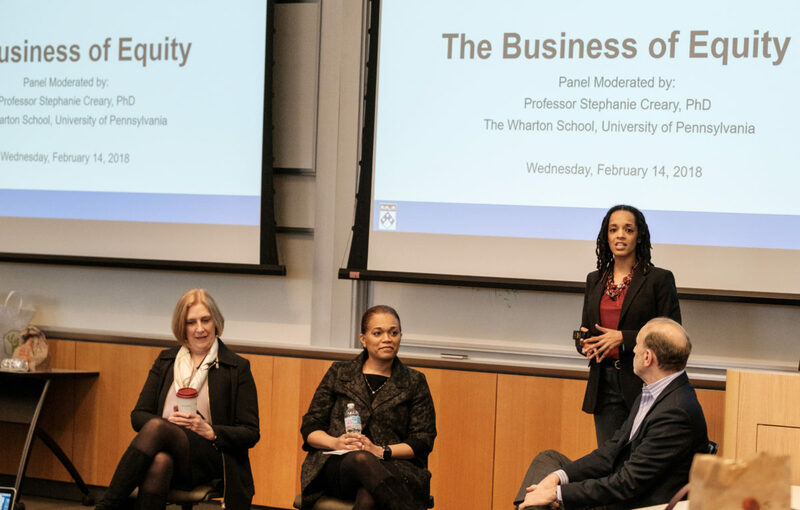 When Creary brings in C-suite speakers from Goldman Sachs and Deloitte to talk about diversity to her MBA and undergraduate classes, they draw aspiring future hires, past company alumni, and students, faculty, and staff from across Wharton. Creary, an assistant professor of management, is new to Wharton this year, but she has a powerful contact list to draw on. Her seven-week class on diversity, offered in separate sections for MBA and undergrads, was Wharton’s first, but she’s already offered it for a second time this spring. “Diversity is a focus on attributes and the numbers. Inclusion is a focus on the experience of people in an organization — and that, for me, is the basic difference,” she said. Creary’s path to Wharton is already a long one. “Where I grew up in Las Vegas, when you say you want to help people for a living, people recommend that you either become a teacher or work in health care,” she said. She earned both a bachelor’s and master’s degree in speech therapy. But during her college years, she became involved in campus diversity efforts. “These were the topics on my mind, both health care and diversity, which are things that I research now. These formed the foundation of the research I do today,” said Creary, who is also a senior fellow at Wharton’s Leonard Davis Institute of Health Economics and affiliated faculty with Wharton People Analytics. As a professional working in health care, she observed dynamics that could only be explained by gender and racial differences, and she decided to pursue an MBA at Simmons School of Management, which at the time was a women’s-only program. The classic MBA curriculum also included thinking about the implications of gender and demographics in business in its organizational behavior class taught by professor Stacy Blake-Beard, her then mentor. Two weeks into the semester, Creary knew that organizational behavior research was what she wanted to do. She earned an MBA, then became a research associate at Harvard Business School and the Conference Board, writing on diversity practice in corporations. After earning her PhD from Boston College, she landed at Cornell as an assistant professor, continuing her work on health care and diversity in organizations. Business of Equity panel: Deloitte’s Terri Cooper, Bank of America Merrill Lynch’s Cynthia Bowman, Prof. Stephanie Creary, Vice Dean Howie Kaufold. Then she got a cold call from Wharton in November 2016 about a position in the Management Department. Creary, who already knew a lot of the faculty in the organizational behavior unit, met with management professors Sigal Barsade, Nancy Rothbard, and Adam Grant during her campus visit, and they talked about the Wharton culture and the climate around diversity and inclusion. “In October , there were lots of different things happening around the United States that caused campuses to have more focused conversations on how we begin to bounce back from toxic climates,” she said. Creary’s most recent publication is about how identity shapes workplace relationships, which she discussed in a Knowledge@Wharton podcast. 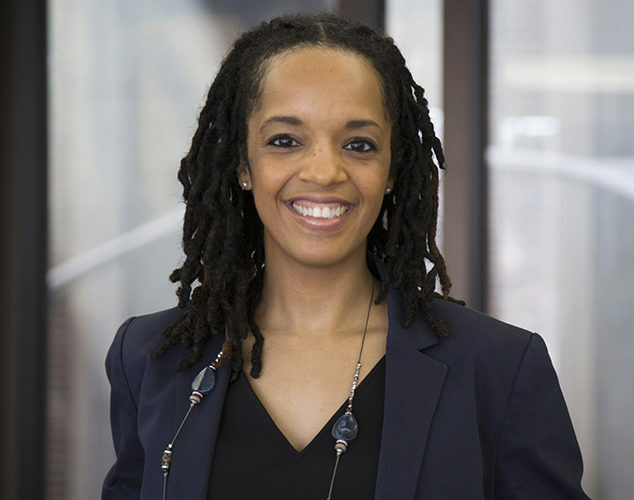 Creary’s work is directly relevant to the careers of Wharton students and she brings her research right into the classroom for her first-at-Wharton Diversity class. “I had to create the course from scratch,” she said. After mulling format, she created a seven-week class with separate sections for undergraduates and MBAs. On the first day, she found that of her 80 students, none had had a classroom discussion about diversity in organizations. They were fearful at first that conversation would turn negative, so they collectively set norms to offset that fear. Her MBA students approach the class differently. Sometimes their experiences are all too real. The students in her classes — both undergrad and MBA — are the ones who are motivated to make changes. Changing organizations is not so easy, and Creary doesn’t have all the answers. She created separate takeaways for how to create diversity and inclusion as individual contributors, as undergraduates will initially be, as managers and leaders that new MBAs will be, and as senior management, which they will be some day. “By showing what people can do at all three levels of the organization with respect to the different topics we’ve been working on, students will see how there are many different pieces to this,” she said. The challenge of diversity work is making sure that it’s a priority from the top and shared throughout the company. One of her guest speakers, Mike Fucci, chairman of the board at Deloitte, told her class, “Diversity moved from a social cause to a business cause five years ago.” Employees with diverse workforces are 70 percent more likely to enter new markets, he said. A model that is working now is making the chief diversity officer a rotational role, drawing from executives throughout the organization, rather than one rooted only in recruiting or human capital. Another way is to create employee business network groups that require sponsors and mentors from throughout the organization. Creary’s Wharton experience is something of a lab in diversity and inclusion. In addition to her class, she worked with MBA students in Return on Equality and the Wharton Graduate Association on programming for One Wharton Week, a celebration and examination of diversity at Wharton. She gave the example of Wharton’s faculty-student lunch program as an inclusive practice, where any student enrolled in her class can sign up for lunch with her. 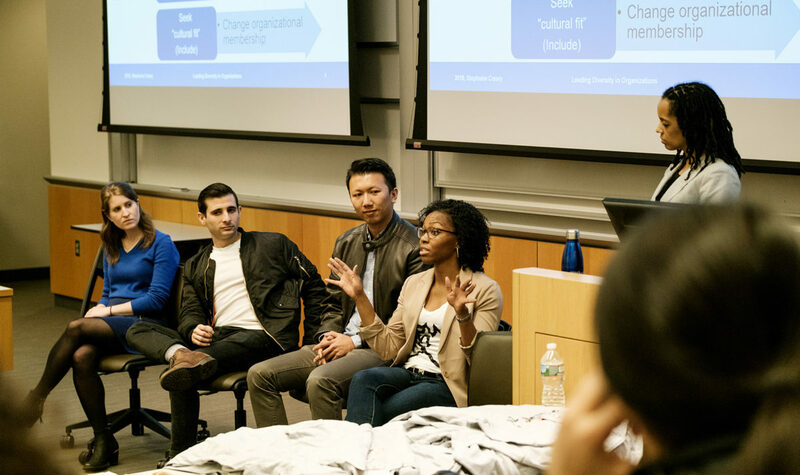 One Wharton Week and the work of the MBA Diversity and Inclusion Taskforce are efforts to create that culture. Creary moderated two events, “Split identities: You vs. YOU,” featuring a panel of students speaking about the multiple identities they reveal in different settings, and “The Business of Equity, a discussion of how to build a diverse organization with Vice Dean Howard Kaufold, Wharton MBA Program; Cynthia Bowman, Chief Diversity and Inclusion Officer, Bank of America Merrill Lynch; and Terri Cooper, US Chief Inclusion Leader, Deloitte. BS, MS in Speech Pathology, Boston University; MBA, Simmons School of Management; MS, PhD, Boston College Carroll School of Management.